Jamie had planned to write a book - 'Campfireology' - a set of metaphoric tales relating to the business world. As part of this process he released a set of these video stories. This is the final one which he posted on 5th February 2013. No-one could have known that only 3 months later he would leave us; but I do believe this video is how he would love to have been remembered - entertaining his audience. 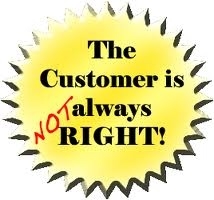 The 7th in the series 'The Customer is NOT always right!' is available below. It is a short (3:35) video and includes 2 stories on why it is so important to understand why the Customer might feel that they are right - even if they are technically wrong.